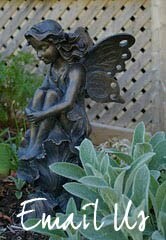 TO ALL GARDEN CLUBS ... PLEASE FORWARD THIS TO YOUR MEMBERS! Let the Gaggle begin! I'm pleased to announce that the 6th Annual Gaggle of Gardeners bus trip is ready to accept registrations. I will require confirmation of your registration and your payment as quickly as possible because I have already pre-sold 35 seats!. This invitation will also be open to other garden clubs and community organizations, and will be advertised extensively. You might see my poster up around town as well. We have booked a 48-seat air-conditioned tour bus which will be filled to capacity (both in the bus and under the bus!). By the time we arrive back in Dartmouth, most of us will have plants on our laps, petals up our nose, and soil in our shoes. Please encourage your family, friends, work colleagues, and neighbours to come along with us--it's going to be a fabulous, fun-filled day of shopping and eating! Feel free to share this email. 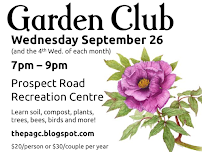 Cost to register for the bus trip is $40.00 for Dartmouth Horticultural Society members, $45.00 for all others (please identify if you are a member of another garden club), and is payable upon registration. If you are paying by cheque, please make the cheque payable to Dartmouth Horticultural Society, NOT ME. We take cash and cheques only--no credit cards. You can give me your payment directly at one of our monthly meetings, you can mail it to me, you can invite me over for tea and crumpets so I can pick it up, or you can drop it off at my house (6 Aberdeen Court, Dartmouth, NS, B2X 1K4). I'd prefer if you didn't etransfer the money to me because I'll probably spend it before it gets to the bank. I don't think I need to worry about etransfers though because many of you don't know how to do it anyway. As in the past, I'm providing you with a tentative agenda for the day (subject to change), and important things for you to remember. Meet at Mic Mac Mall parking lot. If you are facing the "coming soon" Chapters store, look to the far LEFT of the front doors and you will see the tour bus parked there. Bus arrives at Fernwood and we shop. Bus leaves Fernwood and drives to Old Reo Nursery. Bus arrives at Old Reo Nursery and we shop. Bus leaves Old Reo Nursery and drives to Wiles Lake Farm Market. Bus arrives at Wiles Lake Farm Market and we eat and we shop and we pee. Bus leaves Wiles Lake Farm Market and drives to Village Nursery. Bus arrives at Village Nursery and we shop. Bus leaves Village Nursery and drives to Downey's Pitcher Plants. Bus arrives at Downey's Pitcher Plants and we shop. Bus leaves Downey's Pitcher Plants and heads for Oceanview. Bus arrives at Oceanview and we shop. 5:20pm Bus leaves Oceanview and heads for Dartmouth. 6:00pm Bus arrives at Mic Mac Mall where pandemonium ensues. Specific people will be assigned to unload the bus. DO NOT GRAB ITEMS FROM THE BUS--WAIT YOUR TURN! Please make sure your ride is waiting for you. Do not leave your plants behind in your excitement to get home because I will keep them and sell them on Kijiji. And I will leave YOU behind if your partner does not pick you up at the Mall. I enWe strongly enourage you to take a vacation day (if you work outside the home) so that you can join us. 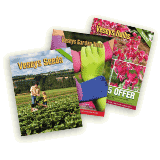 Weekdays at these nurseries are much less chaotic than weekends, and you don't have to wait in long line-ups to pay for your purchases. We get a little special attention from every nursery, whether it's a group discount or a door prize draw or drinks/snacks or free plants. It's worth your while to go on a Thursday! 1. The cost of the tour does not include purchases made at any of the venues nor does it include lunch. It also does not include the driver's tip. If you are pleased with the bus driver and want to offer him a token of your appreciation, I will pass around a plastic bag (probably when we get to Wiles Lake Farm Market) for your tip. Please don't fill up the bag with the spare change floating at the bottom of your purse (it looks awful)—try to give him a bill or at least a toonie. It's a nice gesture and, if we get the same driver again next year, he will really like us and will be extra nice! 2. Please bring the following items with you (just in case): bottled water (there's a washroom available but will soon be filled with plants as we run out of room ), bug spray (if it's humid we'll probably encounter mosquitos), suntan lotion (I refuse to apply it for you), wet wipes (in case you get short-taken), light hooded jacket or hooded sweater (in the event of rain), or clear plastic rain poncho from the Dollar Store. These items can be left on board the bus if you don't need them. The bus is locked at all stops and your purchases/belongings are always safe. 3. I am going to provide you with approximately 20 stickers that will have your name clearly printed which can be attached to your purchases when they are stowed underneath the bus. Many of the centres use the same grey plastic bags and it tends to be confusing when we return to Dartmouth and try to figure out which bags belong to which people. I know you think 20 stickers is too many but I can guarantee that most travellers will use every single one! 4. We are going to try to stick to the agenda as closely as we can, so please try to be back at the bus at the required departure times. I always try to double-check and triple-check that we have everyone on board before we leave the nursery, but mistakes can be made. I am also open to bribes if you need to stay a couple of extra minutes. 5. It might be a good idea to have some cash in your wallet. Not all vendors take debit cards. And I'm not lending you any money. And I will NOT post bail if you get arrested for stealing plants. 6. The bus has a storage compartment underneath the body where we can store our plants and vegetables and baked goods and containers and trees and shrubs and any travellers who can't keep up with the rest of us. Everything will be safe there and, believe it or not, there is little to no damage to the purchases (probably because they are crammed together so tightly!). 7. There will be a minimal amount of walking at the nurseries; however, we will be doing a lot of scurrying from place to place, so be sure to wear comfortable, non-skid walking shoes or sandals. Try to choose pretty ones. Ugly shoes can sometimes offend me. And so do squeaking shoes. 8. Keep in mind that this is a long, busy day, so pace yourself and don't overdo it. I have no intention of giving you mouth-to-mouth resuscitation. And don't forget your medications! 9. Gaggles are fun. Invite someone you normally shop with to join us. Remember, it's not a garden tour ... it's a shopping trip, and the more you spend, the more fun you'll have! 10. Please bring your camera so that you can take lots of photos of our Gaggle having fun. 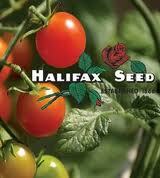 We'll put the photos up on the Dartmouth Horticultural Society's Facebook page later! 11. If you could stuff a couple of Sobeys bags in your purse, it would be appreciated. We might need them for plants or pukers or to steal other people's plants. 12. There will be no refunds once you have paid your registration fee, so it might be a good idea to have a friend on standby to join the Gaggle in your place (just in case you get sick the day of the tour). It would be a shame to waste the seat. Actually, though, it could be used to store extra plants when we get full.